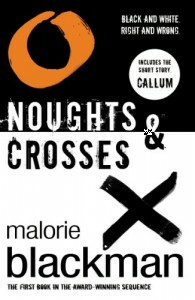 I first read Noughts & Crosses around five years ago and gave it an instant five star rating. On reading it again, I saw why it had so appealed to my fifteen year old self and also that it still appealed to me now at almost-twenty. But I still felt the need to drop it from a five star rating to a four. Noughts & Crosses is the powerful moving tale of a world divided into two: the pale skinned noughts, like Callum, who are considered second class citizens, and the dark skinned Crosses, like Sephy, who are the elite and privileged. The two divisions are never meant to collide. Sephy and Callum did. Friends since childhood, as they grow older their worlds begin to change and it is not so easy to be together, as friends or as anything more. Sephy is naive and doesn't understand why the world has to be this way. Callum is learning the hard way what it means to be a nought in a Cross world. I enjoyed the story as much as I did the first time, couldn't put it down for the day and a bit it took me to finish, and again I cried buckets at the end. But this time I was more aware of little things that annoyed me about the writing, such as the immaturity of some of the narration and the overuse of exclamation marks. I tried to tell myself this is just how people of that age speak (Sephy being fourteen for most of the novel and Callum sixteen) and there was still a clear difference between the two narrative voices, but it still got under my skin a little. Maybe I'm just being picky. Overall, I was still satisfied with the book as I had loved it when I first read it. I was still moved and angry and sad and full of emotion when I read it. The development of the two main characters and their friendship was beautifully done. I felt for them. How hard it must be, when something was always seemed right to you only to be told that it's wrong. The ending was brave! But at the same time it seemed inevitable, for the world that was described. I'm not ready to let go yet, so I'm glad I have the next three books here beside me!